One of my favorite podcasters Pat Flynn’s, of Smart Passive Income and Ask Pat, favorite movie is Back To The Future. 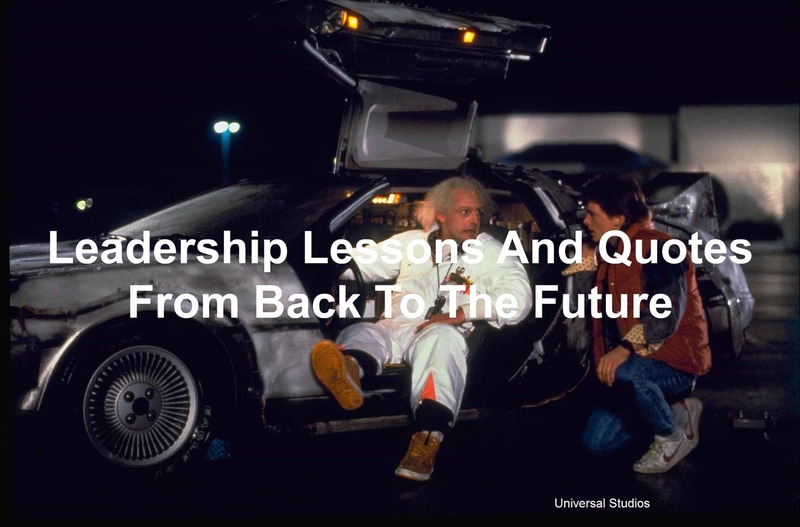 So, I figured why not use Back To The Future as the first “flashback” Reel Leadership article. The year was 1985 when Steven Spielberg produced the now-classic movie Back To The Future. Starring Michael J. Fox as the 17-year old Marty McFly, the enigmatic Christopher Lloyd as Doctor (Doc) Emmett Brown, and Crispin Glover as George McFly in a far-out story about time travel and the implications time travel can have on the universe. Rewatching Back To The Future, I remembered the joy and fun of my childhood watching the DeLorean take Marty McFly back in time all because of the darn Lybians. Not only does Back To The Future provide fun, laughs, and a great two-hour experience, there are plenty of leadership lessons in Back To The Future. So strap in, make sure you’re ready, and let’s go back to the future and see what leadership lessons you can find in Back To The Future. Back To The Future opens with Doc Brown’s alarm clock going off. The camera then pans and you see a coffee maker missing the pot, water pouring onto the hot pad, burnt toast popping in and out of a toaster, and a can opener opening yet another can of dog food only to plop it down on a heaping pile of rotting dog food. Doc had created an automated system to help make his life easier. Yet when there was no one there to monitor the automation, things went wrong. The automated sequences continued to carry out their process even when the process was no longer needed. Automation is great. Implementing automation sequences into your business or life can take away processes you no longer need to touch every day. But this doesn’t mean you shouldn’t touch those processes on a regular basis. Go back and check to make sure the automation is still needed. If not, kill the process and implement new processes that will benefit you or the organization. Marty McFly walks into Doc’s home. After seeing the mess the automated processes has caused, Marty plugs his guitar into a gigantic amplifier. Turning up the power and volume, he strikes the first chord. BOOM! The amplifier explodes and sends Marty flying backward. There was too much power going through the amplifier. I’m sure Marty was scared when he was hit with the soundwave from the overpowered amplifier. The power sent out a concussive force and knocked him on his rump. Leadership gives you power. Power to help build up or destroy yourself and others. When you get too much power, things get scary. You can be corrupted with selfish desires and intent. You can begin to work towards your own means rather than for the betterment of everyone on the team. Be wary of too much power. Find ways to spread the power out. You can do this by building a board of directors, consulting with other business owners, or taking the advice of other people in your business. Doc Brown calls Marty with a request. He needed Marty’s help at the Twin Pines Mall. When Marty arrived at the mall, he discovered the reason. Doc had created a time machine out of a DeLorean. And he needed someone to record the scientific testing going on. Because Doc was involved in carrying out the experiment, he couldn’t record, put Einstein (his dog) into the DeLorean, and control the car. What areas of your business do you need to ask for help in? Do you need help in managing the books? Making your business profitable? Or finding new employees? There are people out there who can help you with these tasks. All you need to do is ask them for help. Marty, one rejection isn’t the end of the world. Jennifer, Marty’s girlfriend, was asking if he had sent in his demo tape. Marty replied he hadn’t. He was scared to be rejected. This came after his band was denied entry into a talent contest. Marty had been rejected once. He didn’t want to be rejected again. Thankfully, Jennifer knew something Marty didn’t. Rejection isn’t the end. It’s the start of a new connection or new try. Stop being scared of rejection. Being rejected won’t ruin you. Marty had come home to discover Biff Tannen had been in a wreck with his dad’s car. Biff was blaming George for the accident, claiming there was a blind spot he should have been warned about. This frustrated Marty. He wondered why his father wouldn’t stand up and confront Biff. George made excuse after excuse as to why he couldn’t. Still, he knew what he should do. He just couldn’t do it. You may be stuck like George. You know the right thing to do but you don’t know how to move forward and do it without causing problems. The problems aren’t what you need to worry about. Standing up for what is right is what you need to be concerned about. Don’t be like old George. If you’ve ever seen Back To The Future, you know Doc Brown is odd. Probably more than odd. He’s eccentric and scatterbrained. And still he was brilliant. Doc created a time machine. He was able to send his dog to the future. And his invention sent Marty to the past. His oddness doesn’t negate his brilliance. Your oddness doesn’t negate your skills either. Whether you’re socially awkward, stutter, or some other social faux pas, you have something to contribute to your organization. Seize upon your oddness and your brilliance like the Doc did. These things will set you apart. As Marty was filming the time travel test, he panned the camera to Doc. Doc saw this and chastised Marty. This test wasn’t about the Doc. The test was about the DeLorean time machine. You have to realize leadership isn’t about you. Leadership is about the team you’re leading. Each individual member is important. Leadership isn’t about you. Take the focus off of you and put the focus in the right spot. Doc strapped Einstein into the DeLorean and set the time. He then used a remote control to get the DeLorean up to 88 MPH. Then sparks flew and flames appeared on the ground. The DeLorean was gone. So was Einstein. Marty believed Doc had disintegrated Einstein and the car. He hadn’t. Doc had sent the car and dog into the future. People will see the actions you take. They will misinterpret why you did what you did. You can’t let misinterpretations stop you from doing what needs to be done. Do the right thing anyway. Do you remember the name of the mall at the beginning of Back To The Future? The mall’s name was Twin Pines Mall. When Marty traveled back to the past, he traveled to the undeveloped area of the mall. There were two pine trees on the property. As he drove the DeLorean to escape the farmer Peabody, he destroyed one of the pine trees. This action rippled through time. Upon Marty’s return to 1985, the name of the mall changed. No longer was it Twin Pines Mall. The mall was now Lone Pine Mall. You may not think you have much of an influence on the future yet you do. Every action you take creates the future that will be. Be aware of what you’re doing and how your actions may impact your future. Whether that’s watching too many movies (don’t cut them out of your life completely) to overworking and losing your family to making poor health choices that will lead to a miserable life when you’re older, each choice you make will ripple through time. Time travel left Marty McFly in a stupor. He thought he was in a dream. The change in scenery made Marty question what had happened. Where was he? When was he? What is going on? Change left Marty with questions. Change will leave you and your team with questions as well. Know that change will leave you questioning things. But you can find answers and regain your bearings. Don’t let the disorientating effects of change stop you from growing! Marty stumbled into Lou’s Cafe, a diner in the past to make a phone call. While there, he runs into a younger version of his dad. They talk and then Goldie Wilson, tells George things are going to change. Goldie’s going to make a difference. The words Marty spoke to the young Goldie Wilson inspired him to run for mayor. And he won! They were simple words Marty spoke to Goldie yet those words changed the direction of Goldie’s life. He now had a new mission: To become mayor. You will interact with thousands, maybe millions, of people throughout your life. You have the opportunity to inspire each and every person you meet. Be kind. Treat others with respect. Give hope. When you do, you’re going to inspire others to greatness. Before Marty traveled back in time, his parents showed their “best” side. His mom told Marty’s sister girls shouldn’t pursue boys. His dad told him to respect women. In 1955, things were different. Marty discovers his dad had been a peeping Tom. His mom was a little loose. They were not who he pictured them to be. You will quickly discover people wear masks. They want to put their best foot forward and protect their image. Be wary of people who are fake. They won’t tell the truth, they act differently around different people, and they won’t admit to their faults. Do you remember how Doc Brown thought of the Flux Capacitor? He had an accident. He fell off of a toilet. And then he drew up the plans for the Flux Capacitor. His accident was the catalyst for his greatest invention. Accidents in your life may not be as bad as you think. They may be exactly what you need to push your next idea forward. The next time you have an accident, consider what the accident makes possible or any thoughts that cross your mind after the accident. Record these thoughts and see how you can use them in the future. To power the DeLorean to travel through time, the DeLorean needed 1.21 gigawatts of power. Doc had used stolen plutonium to power the DeLorean in 1985. The Doc in 1955 didn’t have access to plutonium. What could Doc use? How could he power the DeLorean so Marty could return to 1985? The only thing Doc could think of was a lightning strike. But then you couldn’t predict when lightning would strike. Except Marty already knew the date and time of a lightning strike in 1955. He had the flyer he’d been handed to help Save The Clock Tower in 1985. This was a solution Doc couldn’t have seen coming but it was there, right in front of him. Solutions to your problems are all around you. You need to keep your eyes peeled for solutions, however unorthodox they may be. You saw earlier in Back To The Future how Marty was scared of rejection. He couldn’t handle it. Not long after, you see why. His father was scared of rejection as well. George wrote science fiction but hid his creation from the world. He was scared of hearing his work wasn’t good. That legacy carried over to Marty. He took on George’s fears. Sadly, too many leaders carry on a legacy they shouldn’t. They carry on a legacy of fear or anger or abuse. Look at your life. What legacy are you leaving for the leader who will take over for you? Or what legacy are you leaving for your children? Seek to leave a legacy you would be proud of. George and Marty had come up with a plan for George to win over Lorraine Barnes. Marty would try to get fresh with his mom only to hve George show up and knock him out. Things took a drastic turn though. Biff had seen Marty in the car with Lorraine and he had his boys take Marty away. Then Biff started to attack Lorraine. George didn’t know any of this had happened. He approached the car, opened the door, pulled Biff out, and told him to get his hands off of her. When George realized Biff wasn’t Marty, he had a decision to make. Would he do what was right or would he run like a coward? George manned up, clenched his fist, and knocked Biff out. He did what was right. You have a choice every day. You can make the right decision or the wrong decision. Only you have the power to do this. Choose the right decision. Even if the right decision is the hard decision. You won’t regret it. Scared… All it takes is a little self-confidence. Every leader gets scared at some point. But with a little self-confidence, you can push through the fear. Marvin Berry had injured his hand opening the trunk of his car to save Marty. This put a dent in the Enchantment Under The Sea dance. His band couldn’t continue to play without a guitarist. Marty stepped up and played one song with them. Then he suggested a new tune: Johnny B. Goode, though he didn’t name it. Marvin rushed into an office to call his brother Chuck… Chuck Berry to tell him he’d heard a new sound and the sound may be something Chuck could use. When’s the last time you looked for a new opportunity? Whether the opportunity was a new career path or a new way to grow your business, you need to be on the lookout for new opportunities. These opportunities are all around you. You have to have a keen eye and be willing to jump on the opportunity when the opportunity presents itself. To get Marty back to the future, Doc had strung a cable across the road and to the clock tower. The storm grew strong and something unexpected happens. A tree branch fell across the cable and pulled the cable apart. Doc hadn’t foreseen this situation. Now he had to take quick, decisive action to help Marty get back. He grabbed the cable and pulled. It was a no-go. The cable was pulled down by the tree. Eventually, Doc was able to pull the cord but, in doing so, he disconnected the other end of the cable. Now he had to rig a contraption to get to the street and plug the other side of the cable in. He reaches the ground and tries to plug in the cable. He was too late to actually connect the cable but made a connection through his body. Marty would be able to return to the future. Things are always changing in business. New opportunities present themselves, someone stumbles and causes an issue, or maybe you screw up. Whatever it is, unforeseen situations happen in business. You have to be ready for these situations. Learn to react quickly to developing situations. Then be ready to act. Just before Marty traveled to the past, he saw Doc get shot by the Lybians. He knew something the Doc in 1955 didn’t know. He felt like Doc needed to know. Doc didn’t want to hear any of it. He was scared of changing the space-time continuum with this new information. The thing was, Doc NEEDED to hear what Marty was trying to tell him. This information would save his life. Marty went to great lengths to tell Doc about his impending death. Doc deflected every time. He went so far as to tear up a letter Marty had written. Hearing critical information about yourself or your business can sting. You don’t want to hear the negative yet sometimes hearing the negative situations going on will help you prepare the business for the future. Don’t dismiss information that is critical of you. This information may be the information you need to hear to create effective change. To help Marty get back to the future, Doc had to allow the lightning strike to flow through him. I can only imagine how painful this flow of 1.21 gigawatts of electricity had to be. Yet Doc went through the pain. He knew he had to go through the pain to save Marty. Leadership isn’t sunshine and roses. Leadership has painful moments. You will have to go through pain to lead. Firing someone isn’t painless. Cutting pay isn’t painless. Listening to wise counsel isn’t painless. Great leaders know they have to go through the painful moments of leadership to get to the good stuff. Back To The Future was created in 1985. The year is now 2017. As I watched Back To The Future for this article, I realized just how well done the movie was. The visual effects while dated didn’t detract from the movie. Little things like the Twin Pines Mall becoming the Lone Pine Mall shows the attention to detail that was paid, and the acting was top-notch. The team that created Back To The Future created a movie that has stood the test of 30 years. As a leader, you have the ability to do the same. You can create something of worth that will stand the test of time. Make sure your vision and mission are something worthy of the future. Wait a minute. Wait a minute, Doc. Ah… Are you telling me that you built a time machine… out of a DeLorean? The way I see it, if you’re gonna build a time machine into a car, why not do it with some style? While you don’t have to lead with style, leading with style adds a little something to your leadership. People take notice of flashy and cool. Don’t be something you’re not but lead with YOUR style. Question: Have you seen Back To The Future? If you have, did you take away any leadership lessons from Back To The Future? If you haven’t watched Back To The Future, what was your favorite leadership lesson from Back To The Future that I shared? Let me know in the comment section below.